When deciding on a shredder, it is pertinent that you align the security level of that unit with the needs of you or your organization. In this section you can narrow it down by the security level which is a scale from 2 to 6, with 6 being the highest. Each section is available in all of the top name brands in the industry including Fellowes, HSM, Dahle, and more. Maybe your organization needs documents simply strip cut, or maybe you are dealing with highly sensitive, classified information in which you need them obliterated into a fine powder. Either way, you will find what you need here. Waste Bin Capacity: 8.5 gal. Waste Bin Capacity: 13 gal. Transcript: Welcome to MyBinding comparison videos. Today we look at understanding paper shredding security levels, what do you need, and what shredder can do it. With a great number of shredders on the market, understanding security levels utmost important. In short, there are six security levels in paper shredding, ranging from most general purposes to top secret. Welcome to MyBinding comparison videos. 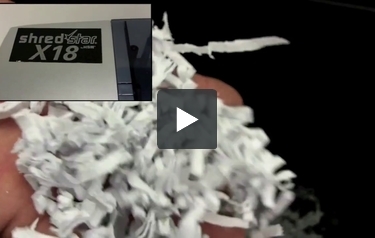 Today we look at understanding paper shredding security levels, what do you need, and what shredder can do it. With a great number of shredders on the market, understanding security levels utmost important. In short, there are six security levels in paper shredding, ranging from most general purposes to top secret. Level one and level two are designed for general shredding purposes, with a strip width of 12 or six millimeters. If it's a strip-cut shredder, it's going to fall into this category. Many cross-cut shredders that cut not only down but also across the paper fall into the same category. Stepping up to level three, which is the most common for confidential, corporate, and personal data, requires a shred no more than 4mm in width and 80mm in length. Many cross-cuts are a level three, like this Destroyit 2240, but not all. The HSM ShredStar X5 is also a level three. You can really begin to see just how small these shreds are getting. Level four is designed for very sensitive, very confidential and commercial and personal data. With a maximum width of 0.8mm and length 15mm. This is Swingline's EM07-06 and it does this microcut level four very well, as does this Fellowes MS-460Ci. Of course, getting to this security level, shredders tend to be more expensive and run slower. And lastly, levels five and six are top secret, espionage-proof, with a total shred area of less than ten or five millimeters, respectively. Pictured here is Swingline's DSM07-13. It certainly is pricey to get a security level this high but these shreds are micro. We hope this video has been helpful. Please give us a call or keep clicking; we want to get you the right shredder for the job. For more comparisons, demos, reviews, and how tos, check out MyBinding.com.